One of our company’s eight core values is patriotism, and we are deeply committed to serving our military heroes and their families both at home and abroad. As a leading distributor of grocery products to U.S. military commissaries, SpartanNash – through our MDV military division – sees firsthand the sacrifices our servicemen and women make to protect our freedoms every day. SpartanNash proudly employs nearly 700 military veterans and family members. As a company, we are committed to hiring, training and retaining veterans, Reservists, Guardsmen and their families in partnership with national and government organizations and initiatives. We were named a 2018 silver-level Veteran-Friendly Employer by the Michigan Veterans Affairs Agency as well as a 2019 Military Friendly® Employer, recognizing our efforts to hire, retain and recognize the vital role veterans play in our workforce. In 2014, SpartanNash was honored with the Patriot Award from ESGR (Employer Support of the Guard and Reserve) for its continued support of its associates who are deployed while working for the company. Each year, SpartanNash commemorates patriotic holidays with companywide tribute events. Memorial Day, Fourth of July and September 11 are all observed with honor — but it is Veterans Day when we collectively pause to recognize and thank all our associates and store guests who have served our country in the Armed Forces or are continuing to do so in the National Guard or Reserves. 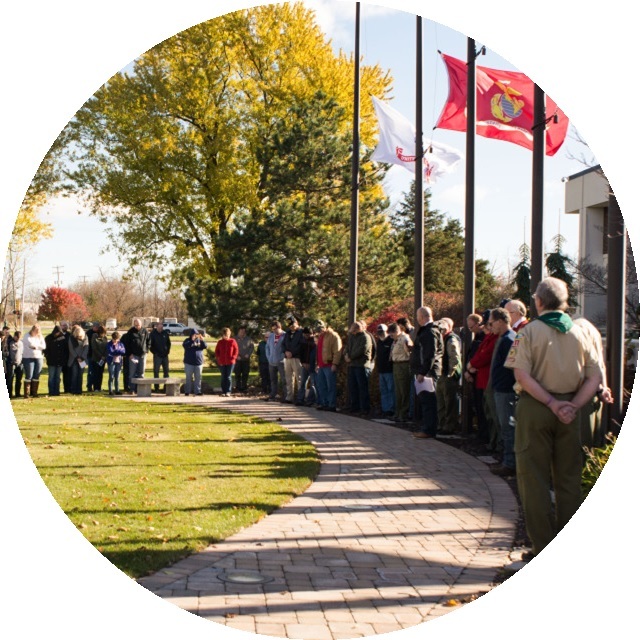 Flag-raising ceremonies are held at each of our 200 facilities that have a flag pole, and a moment of silence is observed at 11 a.m. Companywide, all SpartanNash locations also display posters recognizing and thanking associates who are veterans. In addition to these commemorations, SpartanNash understands the skills and experience veterans and those who continue to serve bring to our workforce. For our veteran and military-affiliated associates, SpartanNash offers a military associate resource group, designed to enhance onboarding efforts and create a network for veterans to tap into for career support and training. SpartanNash has also partnered with GI Jobs, the West Michigan Veterans Coalition, Michigan State University’s Student Veterans Association, the Minnesota Department of Employment and Economic Development Veterans Employment Services and Eagle Group – a Minnesota-based nonprofit organization that provides programs for servicemembers transitioning to civilian life – to expand our outreach and recruitment efforts of veterans and their family members. On Veterans Day 2015, SpartanNash retail stores, distribution centers and service centers companywide began collecting customers’ old, worn, faded and/or frayed American flags for retirement. Flags are collected at each store’s customer service counter, and the stores partner with local veterans group such as the VFW and American Legion or Boy and Girl Scout troops to pick up and to properly retire the flags we collect. More than 2,500 flags have been retired through the SpartanNash program. At SpartanNash, we hold a special place in its heart for Honor and Remember, a nonprofit organization founded by George Lutz, who lost his son Tony to a sniper’s bullet in Fallujah, Iraq, in 2005. The Honor and Remember flag specifically acknowledges American servicemen and women who paid the ultimate price while serving their country. The organization is deeply committed to promoting broad national awareness of and groundswell interest in the flag, so that military, government and educational facilities as well as households throughout the country will begin flying the Honor and Remember flag in recognition of our nation’s fallen warriors. It is also the goal of Honor and Remember to place one personalized Honor and Remember flag in the hands of immediate families who have lost a loved one in military service to America. Personalized flags include the fallen soldier’s name, so the flag can be displayed in honor of them. SpartanNash flies the Honor and Remember flag at our corporate-owned stores and displays the flag artwork on our fleet of tractor-trailers, which travel 67 million miles a year. The company has also provided and continues to provide personalized Honor and Remember flags to some of those who have lost their loved ones in military service to America.